Thread: April 16, 2019: Munchkin Is Everywhere! April 16, 2019: Munchkin Is Everywhere! The majority of our manufacturing flows through the GPI offices and factories, where they produce everything from Zombie Dice to Munchkin Warhammer 40,000 to The Fantasy Trip Legacy Edition. We've produced millions of units (of games, expansions, and accessories) in their factories over the last decade, and they're consistently*our first choice when working on a project. That doesn't mean, though, that we don't investigate options, and that's exactly what led to a fun discovery. Print Ninja is a company we had never worked with, but I have friends who have printed magazines and books through their website. The company's online quoting tool for books is an excellent resource for the times you want a rough idea of what something may cost .*.*. and it turns out that they have a similar tool for producing board and card games. It was while looking at their game-manufacturing options that I ran across*this page on one-off prototypes*and their guidelines on how to create an early prototype of your newest game design. "Get creative and recycle*&ndash;*Find a used game &ndash; eBay is full of them &ndash; that has the same game board, or outer box dimensions that best match your game. Now, prepare your board game image with some spray adhesive and glue it over the existing board. Boom, now you have your own playable board! Follow this same procedure with boxes, punch-outs, tiles or any other component." 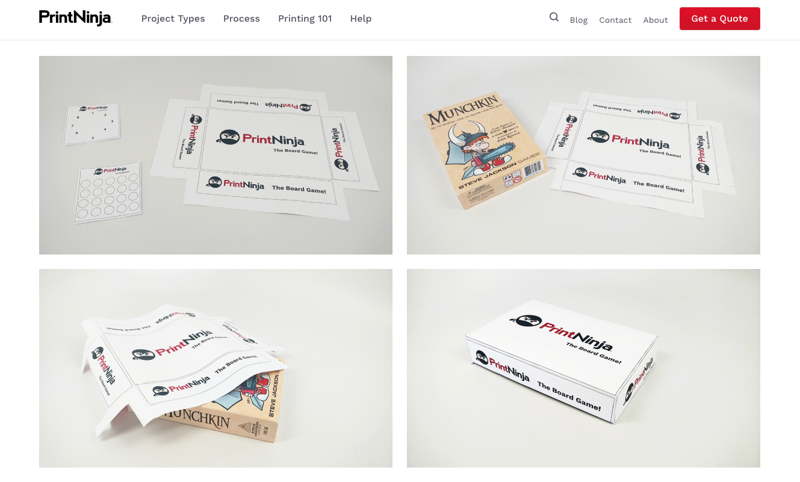 And look, gang, Munchkin is used in their how-to images showing you how to use a standard Munchkin game box as the basis for a prototype box. Secret: Our team does this all the time for early-stage mock-ups, when we need something to photograph or to display at a convention. Roughly 50% of the prototypes in our display case at a convention will be fakes, and many of them have some sort of Munchkin box hiding under the new artwork. So, don't worry over the quality of your game prototype if you've created something new and are using other games as crutches. Everyone does it, and it's best to be as inexpensive and flexible at the earliest stages as possible. If you invest a lot of time and money into slick prototypes, you'll be less willing to change your design as you playtest and learn; stick to the quick and cheap at the early stages and keep your design options wide open. Warehouse 23 News: Big Or Small? Have It All!